I recently tried my hand at making molds of some of my sculpts, and they came out great! As a result, I'm creating a new line of molded pieces, and my plan is to offer a new species each month, if time allows! If you like the look of these pendants and want to purchase one in your favorite bird, drop me a note, or post on my Facebook page and let me know what species you would like to see me create and offer next! Because these pendants are made from a mold, I can offer them at lower prices than my one-of-a-kind sculpts. However, each one is still handmade, so will be individually created and will vary slightly from piece to piece. Most of these new medallion pendants are being sold without chain/cord, although I have several options if you prefer to have a necklace included with the pendant. 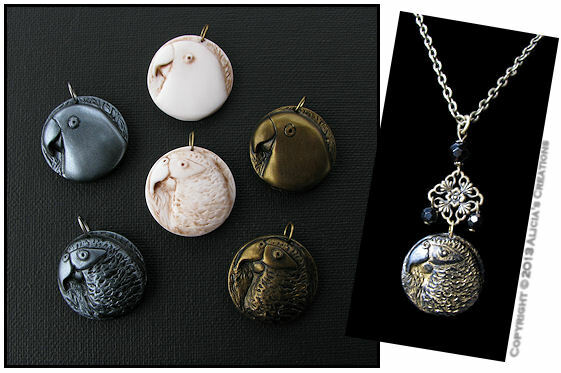 I also created one of the African Grey pendants in a glossy black with metallic gold highlights (above right), on a romantic necklace with a some glass beads and matching earrings. All of the pieces are on auction on eBay and end on Wednesday, December 11th: http://www.ebay.com/sch/parrotjewelry/m.html?_ipg=50&_from&_nkw&_armrs=1&_sop=10"